First minted in 1987, The Britannia gold coin has always offered beauty and reliability. Today, you can buy Britannia coins with 0.9999 fine gold purity. 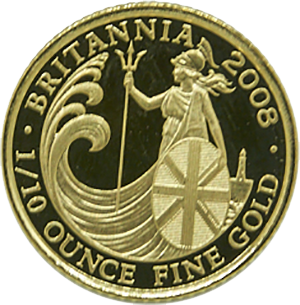 Before 2013, Britannia gold coins had a millesimal fineness of .917 (22ct), with the non-gold component being copper and then silver (in 1989 and 1990 onwards, respectively). Investors choose to buy Britannia for many reasons, including as collectibles or as part of an ongoing investment portfolio. The legendary figure of Britannia, which first appeared on Roman coins in the second century AD, and then brought back for Charles II in 1672, has come to symbolise Britain’s strength and integrity. The beautiful design was created by Philip Nathan is recognised worldwide as the flagship bullion of The Royal Mint. Buy Britannia coins from us at a competitive price, and be exempt from Capital Gains Tax.